There’s a popular way of drawing the distinction between electoral politics and revolutionary politics that I think gets things almost precisely backward. According to this way of thinking, electoral politics represents a peaceful, conversational way of settling disputes, whereas revolution represents an abandonment of persuasion in favour of violence. 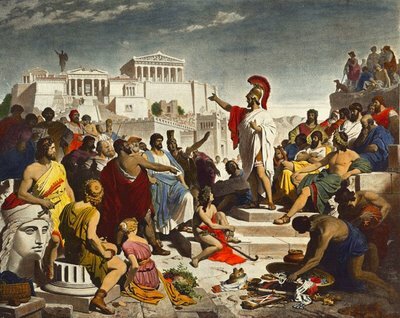 According to the Greek orator Lysias, for example, singing the praises of Athenian democracy, it was “the way of wild beasts to be forcibly subjected to one another, but the way of human beings to define justice by law and to persuade by reasoned discourse” – where by “reasoned discourse” he meant the debates in the assembly that culminated in laws, decrees, and declarations of war. Ironically, even during the Clinton administration, scholars in major journals such as Foreign Affairs noted that in much of the world, the US is considered the leading failed state and the greatest terrorist threat to man. But the US citizenry would never believe this, considering the Fourth Branch of the Government – the media – does not report on international opinion in its entertainment news. 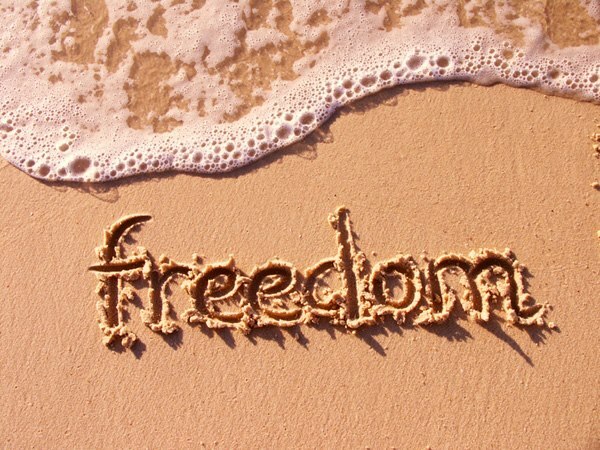 There is the only one true sign of freedom once all is said and done. You can live in a geographical location or tax jurisdiction (fondly called countries) and you are subject to no law except what you agree to so long as you may opt-out as you wish; that simple, your compliance is not mandatory except where your behavior is initiated aggression through force or fraud. So where exactly is this country? It does not exist outside the kingdom of conscience. Strip away all the notions of Constitutional protection, action in the courts to beat back bad laws and all the rest of the distractions and misdirection the government places in your cognitive path and you are left with one stark reality: your refusal. Want to solve the Socialist Security benefit disaster looming on the horizon as a demographic non-funded tidal wave of fiscal despair? The accompanying Medicare/Obamacare fiscal mayhem? The insufficient funding at all levels to meet government employee retirement benefits in the coming years? Recognize the basic human imperative to refuse to comply. I would gladly stop paying Socialist Security and forever opt out. I would be happy to stop paying property taxes in exchange for zero government services I would use. I don’t want to pay for government education camps and government libraries. I don’t want fire services, I would gladly pay for a private subscription service for fire protection much as I pay for car and home insurance (although both would be much more affordable absent government mandates and meddling). This isn’t simply about money; it is about the freedom to choose. This goes far beyond the book by Milton Friedman; he limited his choices within a government framework. This extends to every aspect of our lives whether it is consumption of raw milk, undercooked hamburgers or the ingestion of non-government approved home-grown meat and vegetables. Everything I have just mentioned comes with a penalty, ultimately, of death for the non-compliant in American society. When the SWAT thugs raid the raw milkwarehouse, your refusal to bow and scrape before the “thin black and blue line” may lead to your demise. Ironically, their desire to get off the government teat, as it were, when it came to dairy consumption crossed the line when the regulatory functions were given the middle finger. I won’t belabor the point that cops are the number one danger to human freedom around the globe and I have covered that in detail before. I use that to illustrate the point that American freedom is illusory and non-existent. It is only tolerated as long as the cattle pay the rulers, comply with the Praetorians and don’t stray off the regulatory reservation…ever. Basically, there are two factions that exist in the world, when it comes to metaphysics and epistemology. The basic premises they maintain are at odds and determine how they conduct their lives and the conclusions they come to when it involves moral and political issues. They see reality differently—one hundred eighty degrees of difference. This is an attempt to verbalize those reality differences. Reality will dictate the outcome of the battle and a battle it is—an ideological battle. The lists below represent a general list of what most of the groups believe. However, it stands to reason that one cannot predict the beliefs of any one individual of the group. I will call one group Non-Statists or Limited Statists and the other group Statists-Collectivists. It should be quite evident that these opposite ideas demonstrate why there can never be compromise between them. Publisher’s Note: Greetings Libertopians! September 17 is the day the serfs in the tax jurisdiction known as America celebrate Constitution Day. We hear all the usual ill-informed and ahistorical notions celebrating what was in essence one of the most savvy and lucrative political coups in Western history. The Antifederalists were right, the Constitution was an elegant trap to shackle an entire nation to a system to empower the few over the many and the banksters over the entire system of commerce. The respective states which had signed separate peace agreements with the United Kingdom in 1783 were merely political and inferior subsidiaries to the greater national power emerging in Mordor on the Potomac. The Constitution created a Soviet style system well before the Bolsheviks were even contemplating such a scheme. Whenever you hear some of your friends and neighbors extolling the virtues of the Constitution, read them Spooner’s quote and see how they address that particular conundrum. At the far end of the Seasteading spectrum are independent seastead polities through which Individuals can self-establish political asylum. I can’t wait! At the other end of the spectrum are simple, low-cost ‘blue’ ideas and technologies that can benefit Humanity by utilizing ocean resources. These are the beginnings of the incremental approach to Seasteading. In particular, Costa Rican Water Sciences Professor (and sea-farming researcher extraordinaire) Dr. Ricardo Radulovich, previously introduced, recognizes the value and utility (indeed, necessity) of seasteading to sea-farming. By way of further introduction, through more than ten-years of marine agriculture research in Central America, funded by The Bill and Melinda Gates Foundation and The World Bank, Dr. Radulovich has proven that the ocean can be sustainably ‘sea-farmed,’ in a manner cost-effective for developing countries, to produce nutritious and protein rich macroalgae (seaweeds), shellfish and fish—without requiring an inch of land, a drop of freshwater, or any additional input. Dr. Radulovich’s research has demonstrated a Sea-Farming Efficiency Metric of five persons fed year-round from one-half hectare of diversified sea-farm plot and $200.00 (USD) in material costs, which is extraordinary. An important part of Dr. Radulovich’s research are micro-seasteads, beginning with simple sea-based work stations. 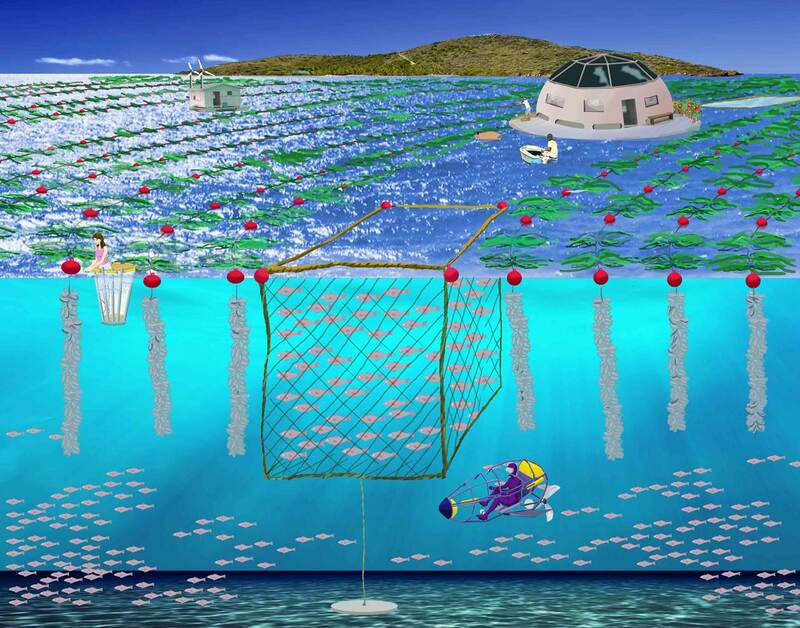 Sea farming, as every form of agriculture, requires frequent monitoring by workers/caretakers to conduct both daily maintenance and to deter theft or vandalism of equipment and infrastructure. Ideally, sea-farmers’ basic needs—namely, safe shelter, food, water, recreation, communication and sewage disposal—would be at least minimally provided at sea. While safety and basic comfort and facilities cannot be compromised, low-cost, locally-available materials can be utilized to create simple work stations alongside sea-farms, supporting researchers, farmers, and initial processors’ basic with basic shelter comforts and workspace. These work stations may be the 21st Century, ocean equivalent of Charles Goodnight’s Chuck Wagon, without which cattle drives as we know them would not have been possible. 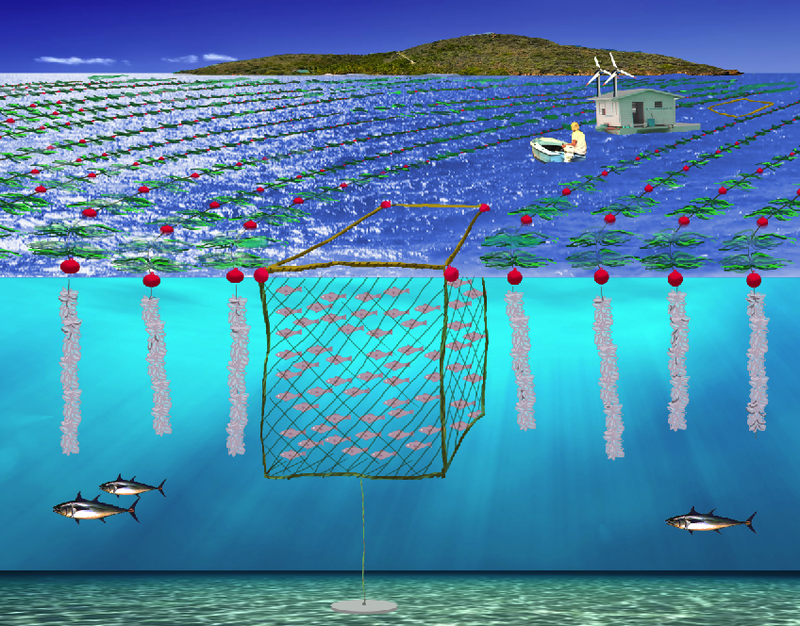 Here’s a glimpse of what Dr. Radulovich has in mind: (Macroalgae on ocean surface, hanging columns of shellfish, low-cost fish cages for filter-feeder and/or herbivorous fish (which theoretically could be utilized as feed for tuna and other pelagic gamefish farms). Repeat after me: Harnessing the ocean’s trophic cyle is the future of food production.